Clients, Build Your Brand, Increase Your Profits . . . Simply By Leveraging Social Media Marketing Strategies! How To Explode Your business with Power of Social Media Marketing—and how you can turn YOUR Business into Cash genrating machine. Build Trust with your customers and Dominate Your Market . If you’re serious about finally feeling in control of your business future, so you can have everything you want and deserve, you need to grab this report. 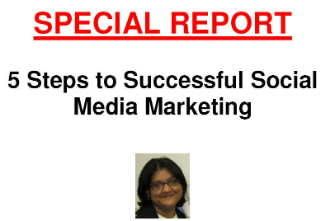 You'll get this awesome report on Successful Social Media Marketing so you can use power of Twitter, Facebook, Youtube & LinkedIn - Social Media Networking sites to explode your business. All For FREE--but the only way to get them is to enter your email below. Do it today and transform your life.